219 Hood Street in Durham is a unique place. A nearby construction site surrounds what seems to be a dilapidated residential building, and a complex just up the block belonging to Durham’s department of public health still smells like fresh asphalt and looks like state funding. A small auto shop sits streetside, with limited parking and intimidating “towing enforced” signs to match. But there are cars in those spaces, cars lining either side of the street. There are people here, the dull roar of a small crowd just barely audible over noise from the highway. People come to this strange little lot in Durham, and they come for Ponysaurus. Self-described as a “forward-thinking, backward-tasting brewery,” Ponysaurus has created a reputation for more than just craft beer. 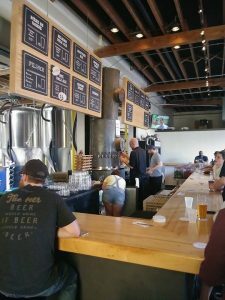 The taproom location in Durham is a unique space, offering interesting food and drink opportunities alongside healthy pours of seasonal brews and Ponysaurus standards. 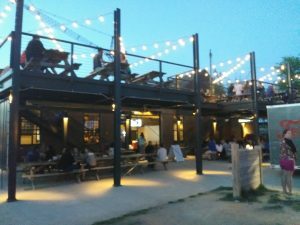 The food at Ponysaurus is definitely a feature, with frequent visits from local food trucks feeding crowds gathered on benches outside the taproom and a selection of house-made snack mixes available for just $1 a scoop. “The Big Cheese” and “Capital Crunch” are favorites, and other scoop-able snacks like Swedish Fish are also available to satisfy sweet toothed-customers. Began in an attic just above The Cookery in Durham, Ponysaurus beers are still center stage at the taproom. Beers meant to be “savored, appreciated, studied, nuzzled and mindfully guzzled” stock kegerators and flow on draft. Named a “Next Level Brewery” by Food & Wine and also recognized as “the best pint in Durham and one of the 50 most underrated breweries in America,” Ponysaurus is certainly on the come-up, with beers showing up on tap in bars all around the Triangle. Customers can tell the difference between the seasonal brews and the standards by the boards showing beer choices above the bar. They all look fairly similar, but close inspection reveals that some are written in chalk while others are painted. Durham is starting to play host to all sorts of small businesses and pop-up shops, driven by a developing urban area that encourages more walkable areas and community engagement instead of simple urban sprawl. 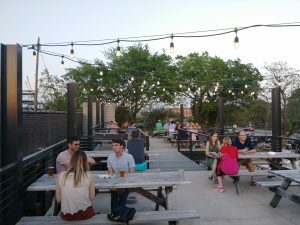 As Durham continues to rise on lists of “the best cities to live in the United States,” more and more small-scale local establishments are expected to appear. Local businesses obviously benefit the area they serve in more than just goods and services, however. The money spent circulates in the local area, instead of being sent or spend elsewhere. The East Durham Pie Company is one such local business. Begun as a one-person operation in 2016 by owner Ali Rudel, the EDPC has developed a reputation through exceptional quality and just enough exclusivity to capture a fervent fanbase. Using the “pop-up shop” model that’s proving to create additional demand by putting time pressure on potential customers, EDPC has been showing up in places (including every Thursday at Ponysaurus) enough to become an open secret in Durham and an elusive legend elsewhere. The East Durham Pie Company doesn’t have a storefront or a food truck. 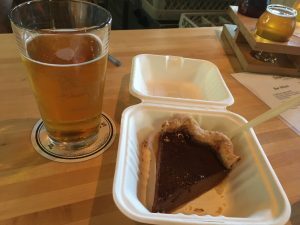 The business is run in-person, by slices and handpies sold in small batches to local businesses and through the EDPC website – where customers can order pies for delivery in the Durham area or for pickup at the weekly Ponysaurus pop-up. But it was the Kickstarter campaign that quickly raised just shy of $25,000 that has propelled EDPC into the limelight, with a neighborhood cafe scheduled to open in Durham sometime in 2017. Rudel used to work at the notable Four & Twenty Blackbirds bakery in New York, which also specializes in pies. EDPC consists of Rudel, one employee and “a husband, which is kind of like an employee.” The three have managed to not only build a stellar reputation in an extremely short amount of time, but also inspire the kind of interest and loyalty that brings in thousands of dollars in Kickstarter money and creates regulars that come back week after week for the now-famous pies. “I like that it makes people happy, even if I’m really sick of doing it or burnt out,” said Rudel. “I get paid to make people happy. How many people get to say that?